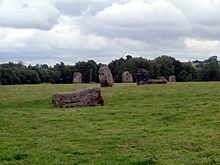 The Hurlers is a group of three stone circles in the civil parish of St Cleer, England, UK. The site is half-a-mile west of the village of Minions on the flank of Bodmin Moor. The Hurlers are north of Liskeard near the village of Minions on the edge of Bodmin Moor in east Cornwall. Just to the west of the circles are two standing stones known as the Pipers, nearby are Rillaton Barrow and Trethevy Quoit, an entrance grave from the Neolithic period. The Hurlers are managed by the Cornwall Heritage Trust on behalf of English Heritage, the name Hurlers derives from a legend, in which men were playing Cornish hurling on a Sunday and were magically transformed into stones as punishment. The Pipers are supposed to be the figures of two men who played tunes on a Sunday and suffered the same fate, according to another legend, it is impossible to accurately count the number of standing stones. The Hurlers comprises three circles that lie on a line from SSW to NNE, and have diameters of 35 metres,42 metres and 33 metres. The two outer circles are circular. 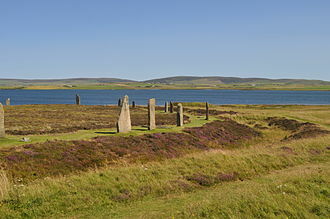 The middle circle, the largest is slightly elliptical, the survival of the southern stone circle, which now contains nine stones, has been most precarious, only two of the remaining stones are upright and the other seven are partially covered with soil. In the middle circle 14 stones survive out of 28, the stones show clear traces of being hammered smooth. The northern stone circle contained around 30 standing stones, from which 15 are still visible, two other monoliths, the Pipers, are 100 metres southwest of the middle circle and may be entrance stones to the Hurlers. The earliest mention of the Hurlers was by historian John Norden and they were described by William Camden in his Britannia of 1586. In 1754 William Borlase published the first detailed description of the site, ralegh Radford excavated the site in the 1930s, and partly restored the two northern circles by re-erecting some stones and placing marker stones in the positions of those missing. Archives from the excavation reports have been re-evaluated by Jacky Nowakowski and John Gould and may result in more analysis. Bodmin Moor is a granite moorland in northeastern Cornwall, England. It is 208 square kilometres in size, and dates from the Carboniferous period of geological history and it includes Brown Willy, the highest point in Cornwall, and Rough Tor, a slightly lower peak. Many of Cornwalls rivers have their sources here and it has been inhabited since at least the Neolithic era, when primitive farmers started clearing trees and farming the land. They left their megalithic monuments, hut circles and cairns, and the Bronze Age culture that followed left further cairns, by medieval and modern times, nearly all the forest was gone and livestock rearing predominated. The name Bodmin Moor is relatively recent, an Ordnance Survey invention of 1813, the upland area was formerly known as Fowey Moor after the River Fowey, which rises within it. Bodmin Moor is one of five granite plutons in Cornwall that make up part of the Cornubian batholith, dramatic granite tors rise from the rolling moorland, the best known are Brown Willy, the highest point in Cornwall at 417 m, and Rough Tor at 400 m.
To the south-east Kilmar Tor and Caradon Hill are the most prominent hills, considerable areas of the moor are poorly drained and form marshes. The rest of the moor is mostly rough pasture or overgrown with heather and other low vegetation, the moor contains about 500 holdings with around 10,000 beef cows,55,000 breeding ewes and 1,000 horses and ponies. Most of the moor is a Site of Special Scientific Interest, Bodmin Moor, almost a third of Cornwall has AONB designation, with the same status and protection as a National Park. The moor has recognised as a separate natural region. Bodmin Moor is the source of several of Cornwalls rivers, they are mentioned here anti-clockwise from the south, the River Fowey rises at a height of 290 m and flows through Lostwithiel and into the Fowey estuary. The River Tiddy rises near Pensilva and flows southeast to its confluence with the River Lynher, the River Inny rises near Davidstow and flows southeast to its confluence with the River Tamar. The River Camel rises on Hendraburnick Down and flows for approximately 40 km before joining the sea at Padstow, the River Warleggan rises near Temple and flows south to join the Fowey. Boscawen-Un is a Bronze age stone circle close to St Buryan in Cornwall, UK. It consists of 19 upright stones in an ellipse with diameters 24. 9m and 21. 9m, with another, there is a west-facing gap in the circle, which may have formed an entrance. 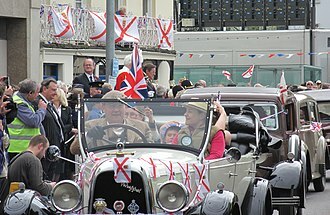 It is located at grid reference SW412274, the Gorseth Kernow was inaugurated here in 1928. 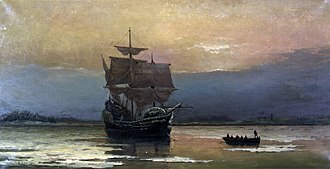 An old Welsh triad mentions one of the three principal gorseddau of the Island of Britain as Beisgawen yn Nyfnwal, which was taken to refer to Boscawen-Un by the Gorseths founders. 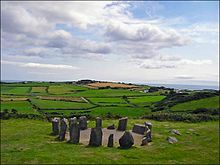 Boscawen-Un is in southwest Cornwall in the Penwith district north of St Buryan by the road from Penzance to Lands End, both the Merry Maidens stone circle and the two Pipers standing stones can be seen as can the sea. Boscawen-Un is a Cornish name, from the words bos and scawen, the suffix Un denotes an adjacent pasture. Therefore, the name translates as the pasture of the farmstead at the elderberry tree, the position of the quartz stone in the southwest may indicate the likely direction of the full moon during the solstice. At the northeastern edge of the circle are two stones in the ground, one of which has an axe petroglyph. 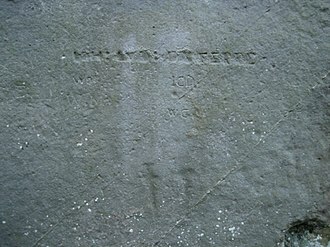 These engravings are unusual in the United Kingdom, though they can be observed on some of the stones at Stonehenge, there is a wide gap in the west of the circle, which suggests the loss of stones. However this gap may represent, as with the nearby Merry Maidens, the central stone is 2.7 m long, but because of its strong inclination to the north-east, the tip is only 2.0 m above the ground. It is thought by researchers that the central stone embodies the phallic male principle. The stone circle at Boscawen-Un, was erected in the Bronze Age and it is possible that it was a meeting place for druids in the Iron Age. 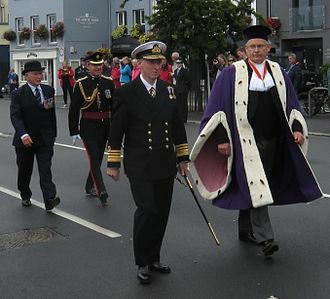 Dumnonia was a kingdom in post-Roman Britain, which probably included Cornwall, in 1928 Henry Jenner founded here at Boscawen-Un, in the course of the revival of the Cornish language and culture, the Cornish Bard Association and called it the Gorseth Kernow. William Borlase mapped the circle in 1754 showing eighteen stones standing and one fallen, the hedge is first mentioned, in 1850, by Richard Edmonds and around 1862 the owner of the land, Miss Elizabeth Carne had it removed and a hedge built. Stonehenge is a prehistoric monument in Wiltshire, England,2 miles west of Amesbury and 8 miles north of Salisbury. Stonehenge consists of ring of standing stones, with each standing stone around 4.1 metres high,2.1 metres wide and weighing around 25 tons. 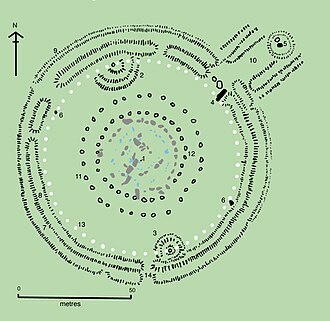 The stones are set within earthworks in the middle of the most dense complex of Neolithic and Bronze Age monuments in England, archaeologists believe it was constructed from 3000 BC to 2000 BC. 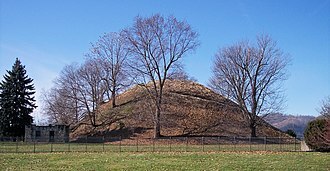 The surrounding circular earth bank and ditch, which constitute the earliest phase of the monument, have been dated to about 3100 BC. 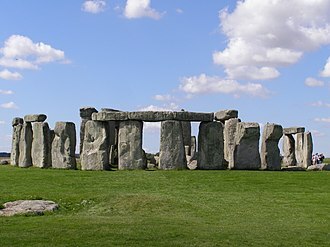 Radiocarbon dating suggests that the first bluestones were raised between 2400 and 2200 BC, although they may have been at the site as early as 3000 BC, one of the most famous landmarks in the UK, Stonehenge is regarded as a British cultural icon. It has been a legally protected Scheduled Ancient Monument since 1882 when legislation to protect historic monuments was first successfully introduced in Britain, the site and its surroundings were added to UNESCOs list of World Heritage Sites in 1986. Stonehenge is owned by the Crown and managed by English Heritage, Stonehenge could have been a burial ground from its earliest beginnings. Deposits containing human bone date from as early as 3000 BC, when the ditch and bank were first dug, William Stukeley in 1740 notes, Pendulous rocks are now called henges in Yorkshire. 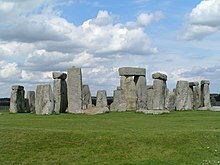 I doubt not, Stonehenge in Saxon signifies the hanging stones. Like Stonehenges trilithons, medieval gallows consisted of two uprights with a lintel joining them, rather than the inverted L-shape more familiar today, the henge portion has given its name to a class of monuments known as henges. 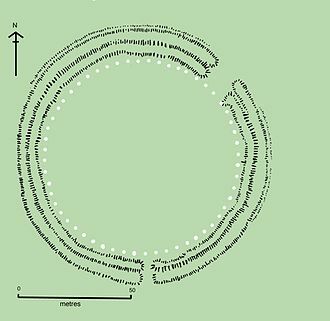 Archaeologists define henges as earthworks consisting of a banked enclosure with an internal ditch. As often happens in archaeological terminology, this is a holdover from antiquarian use, Stonehenge evolved in several construction phases spanning at least 1500 years. There is evidence of construction on and around the monument that perhaps extends the landscapes time frame to 6500 years. A stone circle is a monument of standing stones arranged in a circle. 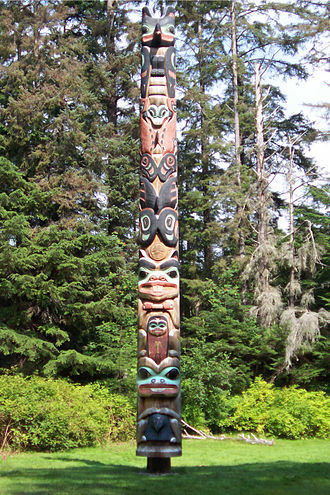 Such monuments have been constructed in parts of the world throughout history for many different reasons. Outside of Europe, stone circles have erected, such as the 6300~6900 BCE Atlit Yam in Israel and 3000~4000 BCE Gilgal Refaim nearby. 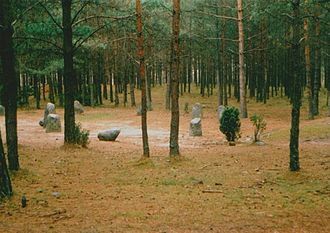 Another prehistoric stone circle tradition occurred in southern Scandinavia during the Iron Age, the size and number of the stones varies from example to example, and the circle shape can be an ellipse. All experts agree that stone circles are of date. Radiocarbon dating has produced a range of dates at different sites. This is at least partly due to an inadequacy of materials suitable for radiocarbon dating that can be obtained from the sites. The diversity of radiocarbon evidence may suggest that stone circles were constructed over a long period. It is often not clear when building started, a further obstacle to dating is that there are generally no other archaeological artifacts associated with the stone circles. Traditional archaeological artifacts, such as pottery sherds, etc. are not often found at the sites, the sites display no evidence of human dwelling, and rarely encompass graves. This suggests that stone circles were constructed for ceremonies and were in use on ceremonial occasions only, the type of ceremonies is entirely unknown. The crudeness and variety of the stones excludes the possibility that they had astronomical observation purposes of any precision, sometimes a stone circle is found in association with a burial pit or burial chamber, but the great majority of these monuments have no such association. A stone circle is a different entity from a henge. That suggests religious context, the details of which are still obscure, during the Middle Neolithic stone circles began to appear in coastal and lowland areas towards the north of the United Kingdom. The Langdale axe industry in the Lake District appears to have been an important early centre for circle building, many had closely set stones, perhaps similar to the earth banks of henges, others were made from unfounded boulders rather than standing stones. Duloe is a village and civil parish in England, United Kingdom. 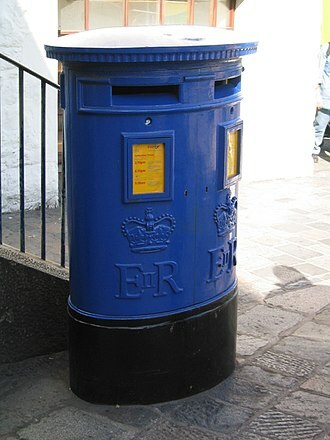 It is situated four miles south of Liskeard at grid reference SX233585. The village of Herodsfoot and the hamlets of Churchbridge, Milcombe, Trefanny Hill, the manors of Brodbane, Lanwarnick and Tremadart are mentioned in the Domesday Book. The parish church of Duloe is dedicated to St Cuby and St Leonard and was built in medieval times. Its plan is unusual since the tower is at the end of the south transept, the tower is 13th century and an upper stage was added in the Perpendicular style. However this stage was removed in 1861, there is a north aisle which continues eastwards to form a chancel aisle which is grander in style and was the family chapel of the Colshull family. There is a monument here of Sir John Colshull. The effigy of Sir John in full armour lies on a slab of stone on top of a tomb chest ornamented with shields. The parclose screen bears coats of arms connected with the Colshulls, both inside and outside the family chapel is more highly ornamented than the rest of the church. Craddock Moor Stone Circle or Craddock Moor Circle is a stone circle located near Minions on Bodmin Moor in Cornwall, UK. It is situated half a mile Northwest of The Hurlers. The circle consists of sixteen fallen stones with one remaining possible stump, john Barnatt has suggested that the circle was situated so that the summit of Brown Willy marked the midsummer sunset. It is nearby to Craddock Moor stone row and an embanked enclosure, christopher Tilley noted what he called a possible axis of movement linking the stone row, an embanked enclosure, the circle and the Hurlers. As these cannot be seen each other, he commented It is difficult to imagine how such a striking alignment could occur purely by chance. One of the first archaeological surveys of Bodmin Moor, including Craddock Moor Circle was carried out c.1800 by Nicholas Johnson and Peter Rose. Chris Barber and David Pykitt suggested that Craddock Moor is named after the ancient British King of Arthurian legend Caradoc who has been linked to the Pendragon Caractacus who fought the Romans, observations on the antiquities and monumental, of the county of Cornwall. Stannon stone circle, Stannon circle or Stannon is a stone circle located near St. Breward on Bodmin Moor in Cornwall, UK. Stannon takes its name from the farm and is sited between two streams on the gentle slopes of Dinnever Hill, two and a half miles southeast of Camelford. It is overlooked on one side by a massive china clay works that now blights the landscape, the circles remoteness is part of its charm with only the wild animals of the moor likely to be encountered. The stones average size is around 0.5 metres with the largest stone in the group having a width of over 1.2 metres. Like Fernacre, Stannon is an example of Alexander Thoms Type A flattened circle, the circle dates from either the late Neolithic or early Bronze Age. 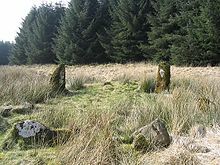 Aubrey Burl and contended that they may be earlier in date than other circles in the area of the moors such as the Stripple stones. John Barnatt suggested this dating and surveyed the site, excavations in the area of Stannon Down were carried out by R. J. Mercer in the late 1960s. Houses were constructed of posts, supporting thatched roofs, partitioned with wood with paved or compressed earth floors, incorporating drainage, flint tools were discovered along with a whetstone that suggested the possibility of metal blades. 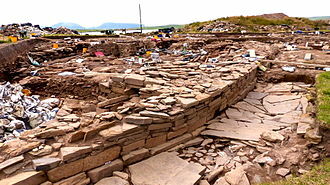 The settlement was estimated to have a population of one hundred people and dated to the Middle Bronze Age. When standing in the centre of Stannon Circle, a point between twenty-two and twenty-eight degrees north from east is marked by Rough Tor. Andy M. Jones reviews studies of the area and called Stannon a Ceremonial Complex, observations on the antiquities and monumental, of the county of Cornwall. Consisting of several essays on the first inhabitants, Druid-superstition and remains of the most remote antiquity, in Britain, with a summary of the religious and military state of Cornwall before the Norman Conquest. Printed by W. Jackson, in the High-Strand, naenia Cornubiae, the cromlechs and tumuli of Cornwall. The prehistoric stone monuments of the British Isles, printed for Nichols and Sons for the Society of Antiquaries. Boskednan stone circle is a partially restored prehistoric stone circle near Boskednan, around 4 miles northwest of the town of Penzance in Cornwall, United Kingdom. The stone circle is in southwest Cornwall north of the road from Madron to Morvah, the enigmatic Mên-an-Tol stones are less than 1 kilometre to the southwest. The stone circle once probably consisted of 22 granite blocks, from which 10 still survive, six stones stand upright, one sits half a metre out of the ground, the others remain lying in the soil. The stones are all about 1 m high, the highest measure approximately 2 m, the stone circle originally described a circle with a diameter of approximately 22 m. The stone circle may have belonged with the nearby barrow to an extensive cult district, Stone circles such as that at Boskednan, were erected in the late Neolithic or in the early Bronze Age by representatives of a Megalithic culture. William Copeland Borlase, a descendant of the earlier Borlase, conducted excavations and found a cist, Borlase described his discoveries in 1872 in his work Naenia Cornubiae, which concerns prehistoric monuments of Cornwall. The De Lank River is a small river in north Cornwall, England. It is a tributary of the River Camel and is nine miles long from its source on Bodmin Moor to its confluence with the Camel two miles south of St Breward. The De Lank River springs from Rough Tor Marsh between the two highest peaks on Bodmin Moor, Rough Tor and Brown Willy, its course is south between the peaks before turning southwest, past the southern foot of Garrow Tor, heading for the Camel. The De Lanks course is within the parish of St Breward. The river flows through an area with few riverside settlements. Its upper reaches cross a moorland plateau and its lower reaches are characterised by ancient deciduous woodland. At Lank, near the confluence with the River Camel, the flows through De Lank Quarries. The De Lank River is an important wildlife habitat noted for diverse and abundant flora, together with the River Camel, the De Lank is an important habitat for the otter which is present along the whole length of the river. The interior of West Kennet Long Barrow. Long barrows such as this one were the dominant form of megalithic architecture before the development of the stone circle tradition. The largest stone in the King's Men, a stone circle that is the dominant part of the Rollright Stones complex in the Cotswolds.